A few years back, I entered into the damp basement of an old building in New York’s posh Upper East Side neighborhood for a gathering of Indian families. 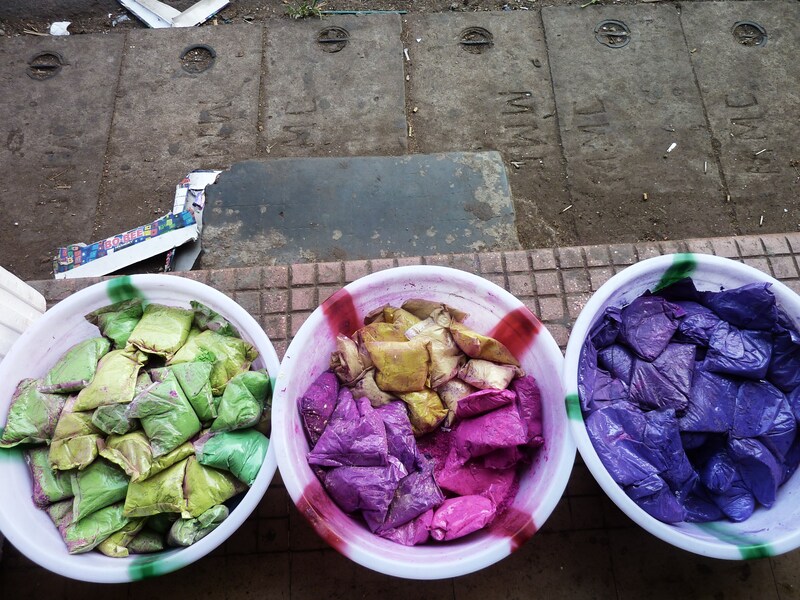 My friend and I were invited to celebrate a mysterious Hindu holiday called Holi. We were the only white guests at the event, but our skin would not remain so for long. Unbeknownst to us, Holi was the festival of colors – a festival that involved the hurling of neon powder until every human was tie-dyed into a spirograph. I wore a black coat that day – a coat that would never quite recover from the event. I left the party looking like a clown that accidentally wandered into a paintball arena, vowing that if I ever made it to India, it would be for Holi. Somewhere in the neon haze of that day in New York, I forgot one key fact: Holi is a Hindu holiday. So when Holi approached and I found myself in Goa — the heart of Christian India — I went into panic mode. Searching Google at the Internet café, the words “Holi” and “Goa” returned little results. 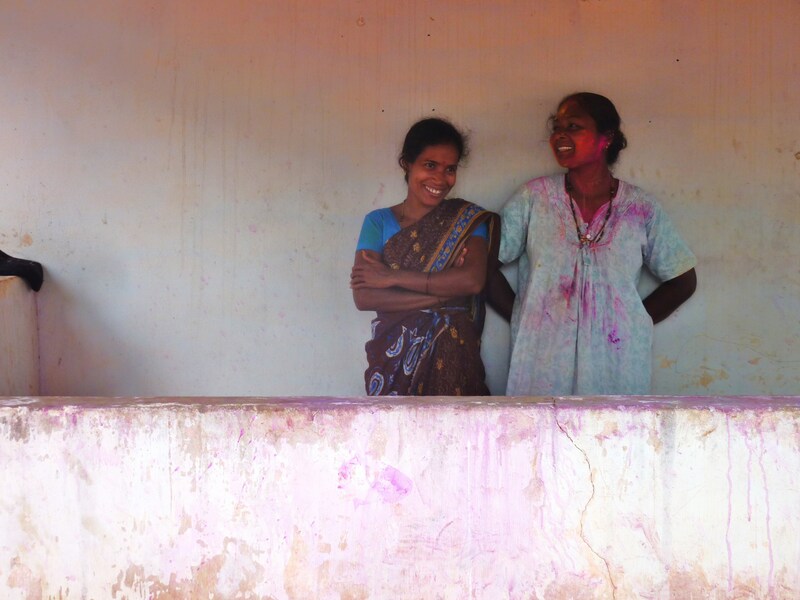 Every blogger recommended staying in Northern India for Holi – anywhere, they said, but Christian Goa. Yet, when I arrived at Goa’s Agonda Beach and saw specks of neon powder on the road, I realized something I knew deep inside all along: no Indian would ever let a holiday go by without celebrating, regardless of where in the country he may live. In southern Christian states like Goa, Holi is celebrated within the greater festivities of Shigmo – a holiday heralding the arrival of spring. As such, the celebration lasts a fortnight and powder flies day in and day out until the festival ends. Many guesthouses along the popular tourist beaches of Goa threw Shigmo parties, but to me, it seemed like an excuse for Indian men to “decorate” Western women with neon powder. 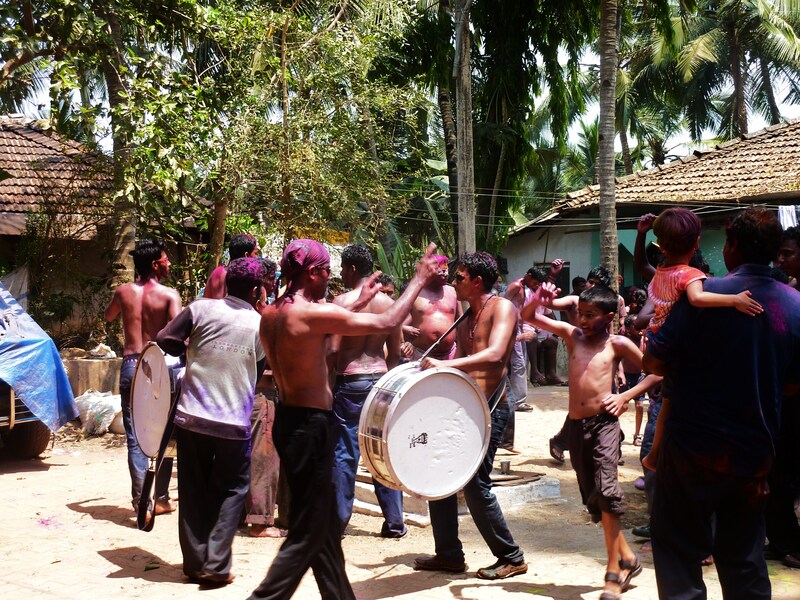 I wasn’t after this sort of Holi celebration, so I rented a motorbike and drove out into the countryside on the proper day of the Hindu Holi looking for a celebration. I found it in the picturesque riverside community of Betul. Hugging the Sal River estuary, the small, homespun village of Betul was the quintessential image of serene, rural Goa. A towering pastel church signaled my arrival in town and the palm-lined main street beckoned me in. Far from the throngs of bespeckled tourists, I arrived in Betul just in time for the festivities. I first encountered the women of the town celebrating separately from the men. Having sufficiently painted each other with powder, the girls rinsed off — fully clothed — in the middle of the street, giggling as they doused each other with water. I felt a tad out of place at the girls’ party so I ventured further into town and found the men, quickly realizing why the women kept their distance. The men pounded on drums and danced in circles around the center of town, flinging powder as they marched. Bare-chested men of all ages formed a mosh pit as the girls slowly edged in on the periphery. The chanting grew louder, the men grew wilder, and colored particles erupted from the volcano of human activity until the entire pack of wound-up neon revelers marched straight to the river and dove in. It was nothing like the Holi in the Upper East Side basement. Nothing like the Holi on the tourist beach. This was the Holi I came to India to find. This entry was posted in funny photos, Goa, India, intelligent travel, photo blog, photography, responsible travel, Southeast Asia, southern India, Travel, Travel in India and tagged betul, christian india, churches in india, goa beaches, hindu holidays, holi goa, holi india, holi powder, new york city indian community, paintball, riding motorbikes, sanskriti, shigmo, shigmo goa, spring celebrations, spring festival, tie dye, upper east side by Mark Johanson. Bookmark the permalink. I love Goa – it would be so much fun to be there during Holi! How do they make the powder in such bright colors?